Forming, running, and selling successful businesses is never easy. The decisions you make can impact profitability for years to come. To ensure you are making the right choices, creating an appropriate plan with an experienced attorney can be invaluable. At Palmer Law Group LLC, we represent entrepreneurs, business owners and individuals interested in forming companies with all aspects of business relationships. With nearly 30 years of legal experience, we work with clients located throughout and outside the United States. Entity selection - There are many different types of entities that are appropriate in specific circumstances. We can help you determine whether you would be best served by operating your business as a C Corporation, S Corporation, general partnership (GP), limited partnership (LP) or limited liability company (LLC). We can also advise you regarding various trusts, such as simple and complex irrevocable trusts, charitable trusts and offshore trusts which may play a part in the business to further your goals. Owner agreements - We handle shareholder agreements and contracts between owners, including funding a business by assets via insurance. If business owners are engaged in a dispute, we can help with the graceful withdrawal of one or more owners from the entity. Employment compensation and benefit issues - We handle cases involving ERISA and compensation matters. Licenses of assets - Our firm can help you with creditor protection planning and allowing a licensee to use intellectual property for your benefit. Leasing of assets - If used in the appropriate circumstance, leasing with proper terms allows an employer to have favorable tax attributes and creditor protection. While maintaining full control over assets, the employer may still be able to borrow against assets, if needed. Sales, mergers and liquidation - There are many ways for owners of an existing company to dispose of their interests in a manner that allows them to take advantage of tax rules. The appropriate mechanism will depend on each individual's circumstance and can produce radically different financial and tax results. For a sophisticated business plan designed to help you meet your business needs, contact our office online or call us at 301-695-0700 or 800-732-7907. 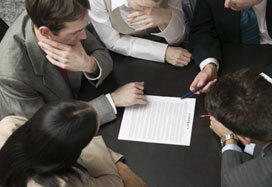 We offer initial consultations with a lawyer skilled in business relationships. While our offices are located in Frederick, Maryland, and Northfield, Illinois, we work with individuals throughout the United States and across the globe.